Biography: John P. T. Mo is Professor of Manufacturing Engineering and former Head of Manufacturing and Materials Engineering at RMIT University, Australia, since 2007. He has been an active researcher in manufacturing and complex systems for over 35 years and worked for educational and scientific institutions in Hong Kong and Australia. From 1996, John was a Project Manager and Research Team Leader with Australia’s Commonwealth Scientific and Industrial Research Organisation (CSIRO) for 11 years leading a team of 15 research scientists. John has a broad research interest and has received numerous industrial research grants. A few highlights of the projects include: signal diagnostics for plasma cutting machines, ANZAC ship alliance engineering analysis, optimisation of titanium machining for aerospace industry, critical infrastructure protection modelling and analysis, polycrystalline diamond cutting tools on multi-axes CNC machine, system analysis for support of complex engineering systems John obtained his doctorate from Loughborough University, UK and is a Fellow of Institution of Mechanical Engineers (UK) and Institution of Engineers Australia. 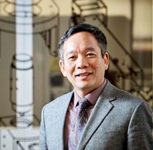 Biography: Professor Shane Xie joined the University of Leeds as Chair in Robotics and Autonomous Systems (2017- ). He received his BE in Control Engineering, M.Sc., and Ph.D. in Mechatronics Engineering from Huazhong University of Science and Technology (HUST), China, in 1992, 1995, and 1998, respectively. He was a Research Associate (1998-1999) and a FoRST (Foundation for Research, Science and Technology) Postdoctoral Fellow (1999-2002) at the University of Canterbury and was awarded a second PhD in Mechanical Engineering. He worked in the University of Auckland, New Zealand as Lecturer (2003-2005), Senior Lecturer (2006-2009), Associate Professor (2010-2011) and Chair Professor (2011-2017), in Mechatronics Engineering. Prof Xie is an elected fellow of IPENZ (Institution of Professional Engineers New Zealand), a Strategic Scientist of Wuhan University of Technology and a Chutian Scholar of Huazhong University of Science and Technology in China. He was the David Bensted Fellow, Simon Fraser University, Canada. He played a leadership role in the establishment of the Mechatronics Engineering programme and was the Director of a Master of Engineering Programme on Medical devices and Technologies (2010-2017) at the University of Auckland. This programme was funded by TEC ($1.8M) to support innovation in medical technology, and was collaborated between the Faculties of Engineering and Medical and Health Sciences, as well as the Medical Technology Association of New Zealand. The programme provided 15~30 Masters each year with multidisciplinary knowledge and skills required to underpin successful innovation in the medical devices industry, filling the large demand for these skills in NZ medical device industry. Biography: Xingjian Jing (M’13, SM’17) received the B.S. degree from Zhejiang University, Hangzhou, China, in 1998, the M.S. degree and PhD degree in Robotics from Shenyang Institute of Automation, Chinese Academy of Sciences, Shenyang, China, in 2001 and 2005 respectively. He achieved the PhD degree in nonlinear systems and signal processing from the Department of Automatic Control and Systems Engineering, University of Sheffield, Sheffield, U.K., in 2008. He is now an Associate Professor with the Department of Mechanical Engineering, the Hong Kong Polytechnic University (PolyU) even since July 2015. Before joining in PolyU as an Assistant Professor in Nov 2009, he was a Research Fellow with the Institute of Sound and Vibration Research, University of Southampton, working on biomedical signal processing. 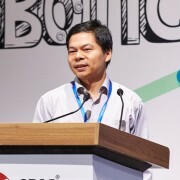 His current research interests include: nonlinear frequency domain methods, nonlinear system identification/control or signal processing, and bio-inspired systems and methods, with applications to vibration isolation or control, robust control, sensor technology, energy harvesting, nonlinear fault diagnosis or information processing, and robotics etc. Dr Jing is the recipient of a series of academic and professional awards including more recently the 2016 IEEE SMC Andrew P. Sage Best Transactions Paper Award and the 2017 TechConnect World Innovation Award. He is an active reviewer for many known journals and conferences. He currently severs as Technical Editor of IEEE/ASME Trans. on Mechatronics, Associate Editor of Mechanical Systems and Signal Processing, and also as editorial board members of several other international journals. Biography: Professor Yonggang Zhu is currently a Professor and director of Center for Microflows and Nanoflows at Harbin Institute of Technology, ShenZhen, China, and Joint Professor at School of Science, RMIT University, Australia. Prior to this, he held the positions of Senior Principal Research Scientist and Research Team Leader for the Microfluidics and Fluid Dynamics Team in CSIRO Australia, Senior Technology Fellow at Melbourne Centre for Nanofabrication. His current research interests include micro- and nanoscale thermal & fluid flows, lab on a chip devices, microtheraml systems, multiphase flows and micro-sensors. He has led many research and development projects in developing advanced technologies for chemical and biological sensing, new materials development, thermal management systems and industry applications. Prof. Zhu has published over 200 papers including book chapters, journal articles, conference papers and technical reports. He is the winner of 2012 Australian Museum Eureka Science Prize for Outstanding Science in Support of Defence or National Security.